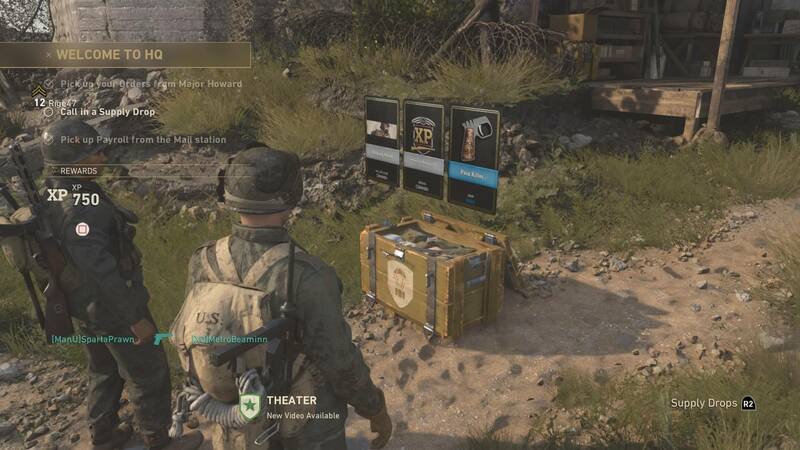 Supply Drops – Call of Duty WW2’s version of loot boxes – are dominating the conversation currently. That said, with all the talk about Call of Duty WW2’s Supply Drops’ fancy / exploitative opening animations, it’s easy to get confused about exactly what sort of content can be found inside, and how to earn them. With Call of Duty: WW2’s paid-for currency, COD Points, having now gone live, you have a way of buying as many Supply Drops as you want. If you’re not looking to spend money, though, there are still a few ways you can earn them just by playing. In general, Supply Drops are awarded for completing in-game tasks, or as random drops at the end of a match. Before we get into it, you should know that there are two types of Supply Drops: regular, and rare. The same goes for Zombies mode, but we’re only going to cover multiplayer Supply Drops here. Also, all the places mentioned here are in the Headquarters social space. There’s a number of ways you can get Supply Drops in Call of Duty: WW2 multiplayer. First, you earn them just by playing the game. There’s nothing in particular that triggers these drops, but you can earn about four an hour if you keep playing. You can earn rare Supply Drops by completing Contracts. Contracts are time-sensitive challenges that you can buy from the Quartermaster using Armory Credits (more on that below). Think of Contracts as bets, you invest in Credits and challenge yourself to get X number of headshots in 30 minutes, X number of kills in certain modes and so on. Not all Contracts reward rare Supply Drops, some just award soldier XP while others offer Armory Credits. The ones that do give rare Supply Drops are much more expensive and challenging than the ones that do not. Another easy way to earn Supply Drops is through Orders. You pick these up from from Major Howard. Like Contracts, Orders also track certain milestones and challenges, but there is no time limit. You can hold six at a time (three dailies, and three weeklies). They’re more forgiving in their requirements than Contracts, though. Likewise, some grant XP while others award Supply Drops, and a few even get you rare Supply Drops. 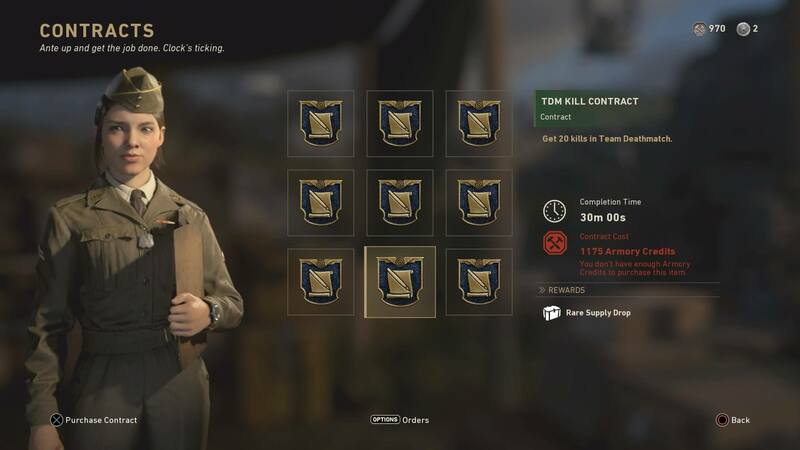 Finishing six daily Orders is a guaranteed way of getting a rare Supply Drop, and the same goes for completing that day’s Special Order. You can keep track of your active Orders in the pause menu. First, you get a daily login bonus of Armory Credits. Armory Credits are also earned as part of some Contracts and Orders. They can also be earned through the Rest & Relaxation area in the Headquarters, which lets you play some classic Activision games. Note that most of that stuff requires a certain amount of Credits to activate or purchase. Failing a Contract, or dying in the Rest & Relaxation area’s arcade games means you lose the investment. Another way to earn these Credits is through the payroll. This is found in the Headquarters Post, which acts as your mail box. The payroll is a free drop of Armory Credits that refreshes every few hours. All you need to do is head to the Post and claim it. This is also where you’ll find your beta calling card and helmet, and other promo items. While you can’t use Armory Credits to buy Supply Drops, you can use them to purchase more Contracts like we mentioned, or the skin / cosmetic item you want. If you don’t want to rely on Supply Drops RNG, you can buy what you want outright, but be ready for exorbitant prices. Visit the Collections tab at the Quartermaster to see all the possible rewards and their Credit prices. In Call of Duty WW2, Collections work the same way they did in Modern Warfare Remastered. That means completing a Collection for, say the Grease Gun, unlocks the most premium skin at the top. Supply Drops contain a variety of items, but none of them offer any gameplay advantage, at least for now. These can be timed XP boosts such as weapon XP, soldier XP, Division XP and so on. You can also find different weapon camos, cosmetic weapon variants, cosmetic attachment variants, gestures, and calling cards. Some weapon variants have built-in XP bonuses and other similar buffs. Everything follows a tiered rarity structure, with common, rare, legendary, and epic. Social Score is another progression system Call of Duty WW2 multiplayer offers, on top of soldier XP, weapon XP, Division XP, etc. You earn Social Score simply by spending time in the social space Headquarters and taking part in one of several activities there. You don’t know prior to doing these how much Social Score they offer, you simply get a few points of it every few minutes. The score does not fluctuate like some competitive ranking, but instead continues to increase. Finally, you commend a player by inspecting them to increase their social score. Having a high Social Score improves your odds when opening Supply Drops. Outside of hanging out in Headquarters, there are a few others things you can do to increase your Social Score. Watching other players call in their Supply Drops increases it (and awards soldier XP). In fact, one of the first daily Orders you’ll see will task you with doing this very thing. You also earn Social Score by competing in the 1v1 Pit, testing your skills in the Firing Range, opening your own Supply Drops in front of other players, watching livestreams and other videos in the Theatre area, taking part in some timed events in Headquarters like defending it from an air raid, or spending time in the Prestige area – only accessible to players who have prestiged. That’s it for now, but keep checking the Call of Duty: WW2 tag for more. We’ve just updated the beginners tips page, for instance.